Routing improvements part II: securing the neighborships. Setting up a routing protocol neighborship isn’t hard. In fact, it’s so easy I’ve made them by accident! How? There were already two OSPF neighbors in a subnet and I was configuring a third router for OSPF with yet another fourth router. But because the third router had an interface in that same subnet and I used the command ‘network 0.0.0.0 255.255.255.255 area 0’ the neighborships came up. This serves as an example that securing a neighborship is not only to avoid malicious intent, but also to minimize human error. Note a few differences. EIGRP uses a key chain. The positive side about this is that multiple keys can be used, each with his own lifetime. The downside: administrative overhead and unless the keys change every 10 minutes it’s not of much use. I doubt anyone uses this in a production network. BGP does the configuration for a neighbor (or a peer-group of multiple peers at the same time for scalability). Although there’s no mention of hashing, it still uses md5. It works with eBGP as well but you’ll need to agree on this with the service provider. The new OSPF version allows for more. Now before you decide that you’re not using this because you don’t run IPv6, let it be clear that OSPFv3 can be used for IPv4 as well. OSPFv3 does run on top of IPv6, but only link-local addresses. This means that you need IPv6 enabled on the interfaces, but you don’t need IPv6 routing and there’s no need to think about an IPv6 addressing scheme. This new OSPF version shows two advantages: you can configure authentication per area instead of per interface, and you can use SHA1 for hashing. The key has to be a 40-digit hex string, it will not accept anything else. A non-hex character or 39 or 41 digits gives a confusing ‘command not recognized’ error. The SPI vaue needs to be the same on both sides, just like the key of course. The final command is to show optional BFD support. For EIGRP you can define the neighbors on the router locally, instead of discovering them using multicast. This way, the router will not allow any neighborships from untrusted routers. Static neighbor definition is one command, but there is a consequence: EIGRP will stop multicasting hello packets on he interface where the static neighbor is. This is expected behavior, but easily forgotten when setting it up. Also, the routing process still needs the ‘network’ command to include that interface, or nothing will happen. Small yet useful: checking TTL for eBGP packets. By default an eBGP session uses a TTL of 1. By issuing the ‘neighbor ebgp-multihop ‘ you can change this value. The problem is that an attacker can send SYN packets towards a BGP router with a spoofed source of a BGP peer. This will force the BGP router to respond to the session request (SYN) with a half-open session (SYN-ACK). 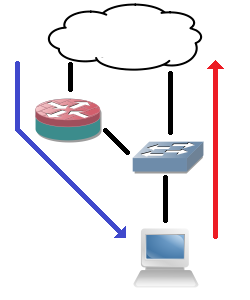 Many half-open sessions can overwelm the BGP process and bring it down entirely. These simple measures can help defend against the unexpected, and although it’s difficult in reality to implement them in a live network, it’s good to know when (re)designing. Routing improvements part I: Bidirectional Forwarding Detection. Another series of articles. So far in my blog, I’ve concentrated on how to get routed networks running with basic configuration. But at some point, you may want to refine the configuration to provide better security, better failover, less chance for unexpected issues, and if possible make things less CPU and memory intensive as well. While I was recently designing and implementing a MPLS network, it got clear that using defaults everywhere wasn’t the best way to proceed. As visible in the MPLS-VPN article, several different protocols are used: BGP, OSPF and LDP. Each of these establishes a neighborship with the next-hop, all using different hello timers to detect issues: 60 seconds for BGP, 10 seconds for OSPF and 5 seconds for LDP. First thing that comes to mind is synchronizing these timers, e.g. setting them all to 5 seconds and a 15 second dead-time. While this does improve failover, there’s three keepalives going over the link to check if the link works, and still several seconds of failover. It would be better to bind all these protocols to one common keepalive. UDLD comes to mind, but that’s to check fibers if they work in both directions, it needs seconds to detect a link failure, and only works between two adjacent layer 2 interfaces. The ideal solution would check layer 3 connectivity between two routing protocol neighbors, regardless of switched path in between. This would be useful for WAN links, where fiber signal (the laser) tends to stay active even if there’s a failure in the provider network. This makes the routing protocols much more responsive to link failures. For MPLS, the LDP session cannot be coupled with BFD on a Cisco device, but on a Juniper it’s possible. This is not mandatory as the no frames will be sent on the link anymore as soon as the routing protocol neighborships break and the routing table (well, the FIB) is updated. Not bad for a WAN line. Yes, a bit of everything, that’s what it has been lately. First, I’m upgrading my home lab switches with more recent IOS versions. The 3560 on my desk can now run EIGRP for IPv6. My 2970 gigabit switch will follow tomorrow, with a K9 IOS this time to make it accessible via SSH. Second is that I’ve been fine tuning my knowledge of layer 2 security features, using my 3560 desk switch and a 3750 test switch as subjects. RA Guard works great, and so does DHCP Snooping. DHCP Snooping has revealed a third functionality to me, next to countering rogue DHCP servers and preventing DHCP flooding: it also detects when a MAC address that sends an INFORM cannot be present on that port according to the mac address-table. It will generate a ‘%DHCP_SNOOPING-5-DHCP_SNOOPING_MATCH_MAC_FAIL’ message and drop the frame. Seems to be a functionality related to ARP Inspection. And ARP Inspection, on the other hand, requires some planning of your DHCP servers: if multiple are present and they all reply at the same time, the DHCP Snooping feature, on which ARP Inspection relies, sometimes picks the wrong packet to add to it’s binding table. The client device selects another packet of the ones it received to configure itself, and thus ARP Inspection thinks there’s spoofing going on. I’m still figuring out how to effectively counter that. Third is that I’ve ordered the CCIE Routing and Switching Certification Guide, 4th Edition hardcover, so I have a lot of reading to be done soon. I have to admit that I don’t like to read ebooks on a big screen so far, and I’m reluctant to buy a reader. Yesterday I also tried a MPLS lab for the first time, with BGP-MP in GNS3. It did take me several hours but I managed to get it running. Not bad for never having done anything MPLS related before. Still, it’s a huge topic and I’ll need to learn a lot more about that. And last, I tested an Aruba Remote Access Point (RAP). I’ve already tested Instant Access Points. The RAP works different: once booted, it needs an internet connection. When connecting a computer (it has LAN interfaces, just like a consumer-grade router), it redirects to a setup page, where you have to enter the public IP address of a Wireless LAN Controller (WLC). It then tries to negotiate a tunnel through NAT-T over UDP port 4500 to that WLC. It works by encapsulating IPsec in a UDP header, bypassing any NAT devices that are incapable of keeping the NAT state of IPsec. The RAP tries to authenticate itself at the WLC using his MAC address. After whitelisting it and configuring a wireless profile (which contains the list of SSIDs to send out), I had to reboot the RAP. I ended up rebooting it several times, thinking it didn’t work, but eventually it turned out my cable had broken due to all the times I plugged it in and out again. The RAP booted fine and started sending out the correct SSIDs. Initially, the wireless connection didn’t hand out an IP to me, but after five minutes, everything suddenly got an IP and started working as if there had never been a problem. Not sure why this happened, although I suspect my NAT router of dropping some of the UDP packets (which wouldn’t be the first time). A little bit of everything indeed. BGP is a typical CCNP/CCIP topic, as is IPv6. But a combination of the two is rarely mentioned. Yet, just as with IPv4, BGP is mandatory for internet access. For IPv6, MultiProtocol BGP or MP-BGP is used. Some details here. ‘ipv6 unicast-routing’ is obviously required to make IPv6 routing possible. The interfaces are configured with the appropriate addresses and BGP for AS 65001 is set up. ‘no bgp default ipv4-unicast’ is the first important command here: it changes BGP to support multiple protocols. ‘address-family ipv6’ is the second important command: it defines the IPv6 parameters. Just like with standard BGP, a ‘network’ command defines the network(s) to advertise. And just like standard BGP, the network has to be present in the local routing table or no advertisement will be made. Note that I’m advertising a /64 subnet here. While this works, in practice most ISPs will not accept a prefix more specific than a /48. Also, for once the ‘exit’ command is different, though typing ‘exit’ will work just the same. Oh, and the ‘router-id’ command is because no IPv4 address has been defined, which normally determines the router-id. MP-BGP works and networks are propagated. Interestingly, the IOS allows you to define IPv4 MP-BGP peers for IPv6 networks, accepting all commands. It even tries to set up a TCP connection, but this connection times out, looping forever and never establishing completely. I’m not sure why this is, as I had expected the TCP session to form but no information being exchanged because of missing next-hop IPv6 addresses. It seems IOS is a bit buggy on this part. I used this information on the Cisco website as part of this example.